Completely remodeled in 2017. 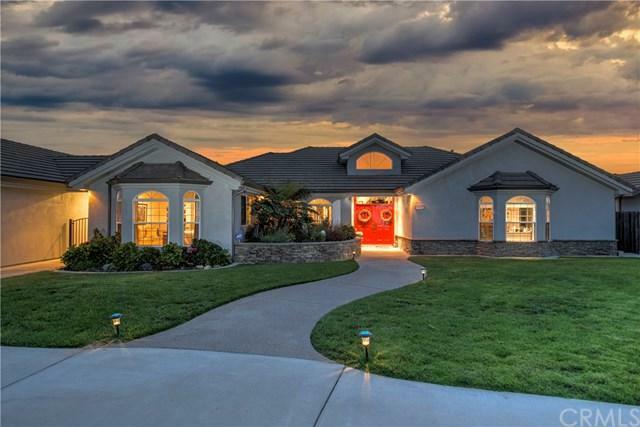 Situated on over 1 acre of lusciously landscaped grounds in one of San Luis Obispo County's best micro-climates, this 3150 sq. ft. home was built for entertaining (both indoors and out) and features 4 bed, 4 baths, plus 200+-sq/ft indoor office. The+-chef+GGs kitchen has double sinks, Subzero Glass+-Refrigerator, Decor+-appliances, 6 burner gas cooktop,+-double ovens, and+-oversized island with double drink drawers.Living room features include a+-beautifully handcrafted wood burning natural stone fireplace, custom cabinets and entertainment system. The spacious master+-bedroom has a vaulted ceiling, large walk in closet, and the master bath offers both a walk in shower & large soaking tub. All main area locations are illuminated with an abundance of natural light from the numerous view windows with custom window treatments and doors that offer access to the rear yard with multiple patio areas. Fruit tree orchard is situated on the south side of yard. +-A private oasis +G+she-shed+G- in the back is crafted with french doors and just over 12 by 12 feet. Concealed lighting under the eaves exterior adds a dramatic flair at night as the building. Separated from the house by a breezeway, the 3 car garage boasts a huge array of cabinets for ample storage (32 doors). The professional tennis/ sport court is 60 ft wide by 120 ft long. Completed new leech line system added to septic and installed Dec/Jan 2018. Sold by Marc Canigiula of Taylor Hoving Realty Group.